MANILA -- Past defenders of the country were honored with World War II medals and recognitions at the Philippine Army Headquarters in observance of the annual Philippine Veterans Week here Friday. 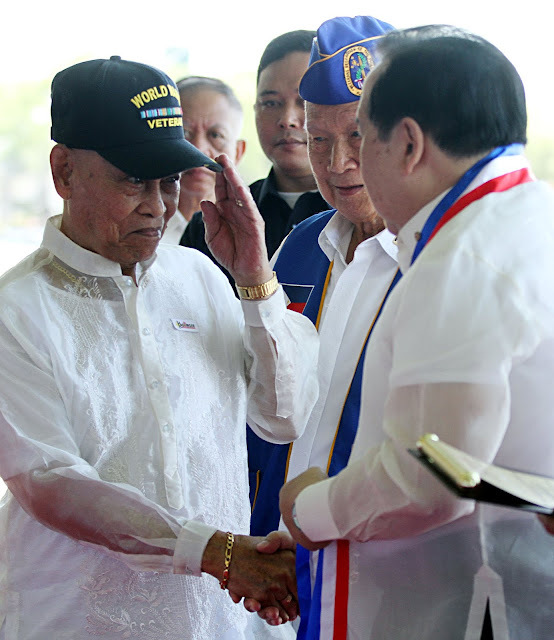 At the review in honor of the veterans in Taguig, 14 living and two posthumous awardees were named, with 97-year-old 2nd Lt. Benjamin de Guzman being the oldest veteran recognized.“We have given priority to World War II veterans, so we search for those who are still living but we also give posthumous awards," Defense Undersecretary Ernesto Carolina said in an interview with the Philippine News Agency (PNA). "After the war, the government issued an order allowing them to wear certain medals -- World War II medals, liberation medals. Back then, the veterans themselves pay for the medals, so a lot of them went back to the provinces and they never got formally awarded. So better late than never," he added. Carolina said the Philippine government will continue giving recognition not only to acknowledge their bravery but also to raise awareness among Filipinos that their freedom came with a price. "This is to make people aware that the freedom they enjoy now is not free. Some people died for that freedom. It is important that we always remember this, particularly the young generation," he said. "Our youth now, we look at them as our future defenders. That's why we take care of these veterans to send out a very important message, to project a strong signal that we are a country who does not forget its defenders." Retired 2nd Lt. Benjamin de Guzman receiving a medal of recognition from Senator Richard Gordon. Clad in barong, Private 1st Class Elino Evangelista, in an interview with PNA, expressed his gratitude over the long-overdue recognition of his service during World War II. "Napaka-hirap noong panahon na 'yon, under Japan ang Pilipinas noon. Ang tanging nasa isip ko noon, kapayapaan (The time when the Philippines was under Japan was such a difficult era. The only thing that I was thinking of was peace)," he said. Evangelista initially enlisted with the Unites States Army in 1946 and was assigned to the New Philippine Scouts as a rifleman. Evangelista shakes hand with Senator Gordon during the awarding. Back then, the war veteran served with the occupation forces in the war-torn island of Guam, assisting its rehabilitation as well as maintaining peace in the territory. "Noon napaka-hirap. Kapag ikaw nasa giyera, nandiyan ka. Umuulan, nandiyan ka. Mainit, nandiyan ka. Punong-puno ka ng kargada, binabaril ka. Lumaban ako sa Hapon para makuha 'yong ating kalayaan na ngayon ay tinatamasa natin (It was really difficult back then. We had to be there, whether in fighting the war, rain or shine. We were being fired at, even if we were carrying a load. I fought the Japanese to be able to attain the freedom that we have now)," he added. 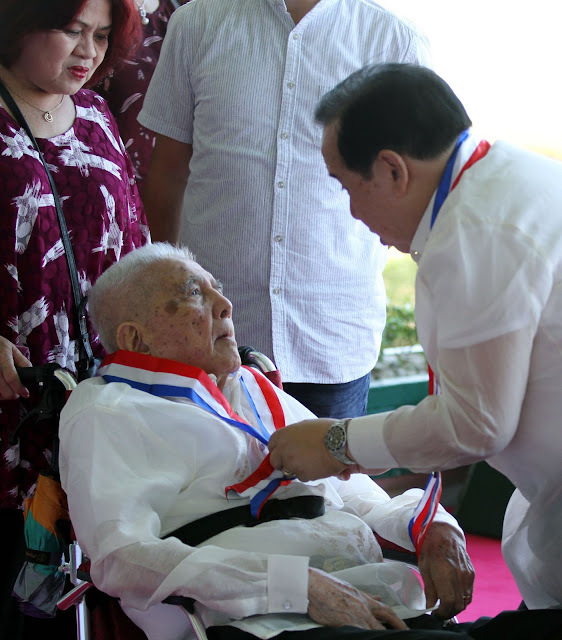 Honorably discharged in May 1949 during the demobilization period of all wartime combat units, Evangelista, who turns 90 years old on May 3, said he is grateful that he is still alive to witness peace and even receive an award for achieving it. "Ako'y maligaya ngayon, buhay pa ako (I am happy that I am still alive)," the former soldier, close to tears, said. Named alongside Evangelista and de Guzman as World War II medal recipients were retired S/Sgt. Alberto Galarpe, Private Carlos Cruz, Cpl. Pedro Peralta, T/Sgt. Ricardo Sarinas, Cpl. Alfredo Arriola, Private Venancio Oblena, Private Gaudioso Salazar, PFC Policarpio Baguisi, PFC Amado Tolentino, T/Sgt. Casiao Tigaronita, S/Sgt. Rigoberto Zuniga, and Private Ricardo Tabije.